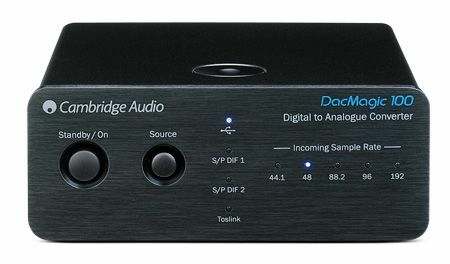 The Cambridge Audio DacMagic 100 digital-to-analogue converter is illed as a simple system-booster for a variety of sources – a neat-looking little unit. It replaces the original DacMagic, and even costs £30 less. And Cambridge Audio has done well to cram so complete a range of features into so small a chassis: if you want to connect a TV, computer or set-top box, for instance, you can choose from dual coaxial sockets, a solitary optical input and a single USB input, and feed them out into a stereo or AV amp through the box’s phono outputs. The USB socket is asynchronous, meaning the DAC handles clock duties, dictating when it receives digital data from the source: the designers say this makes for more efficient data transfer and improved sound quality. All the major sample rates are catered for – 16-24bit, and 32kHz all the way up to 192kHz for high-res audio files. That 24-bit/192kHz capability will work over USB with Macs out of the box: if you use a PC, you’ll need to download Cambridge Audio’s driver software from its website. You’ll also have to switch the DAC’s USB socket from USB 1 Mode to USB 2 Mode by holding down the source button whilst switching it on from standby. Fed a 16-bit/44.1kHz rip of Dusty Springfield’s Son Of A Preacher Man, the DacMagic 100 serves up an open, spacious sound. Vocals are given space to breathe and, even with a mix of instruments thrown in, everything knits together well. Move on to Emeli Sandé’s Heaven and the Cambridge paints a tonally even picture with well-mannered treble and weighty, precise low frequencies. Detail levels are good for the money, although the track doesn’t quite have the same impact or dynamic reach as when it’s played through rivals such as the Arcam rDAC. REM’s Losing My Religion in 24-bit/192kHz form sounds pleasant, but lacks sparkle and emotion. For the money, the DacMagic 100 is an attractive and competent system booster, but it isn’t quite the best in its class. For this kind of money, and provided we didn't need the input flexibility offered by the Cambridge Audio, we'd go for the HRT Music Streamer II, a simple USB-only model, or – for a bit more chocice whent it comes to inputs – the Arcam rDAC.